Kate Somerville sees and treats a variety of skin in her Skin Health Experts Clinic, based in Los Angeles, but the main concern her clients have is finding ways to look younger. 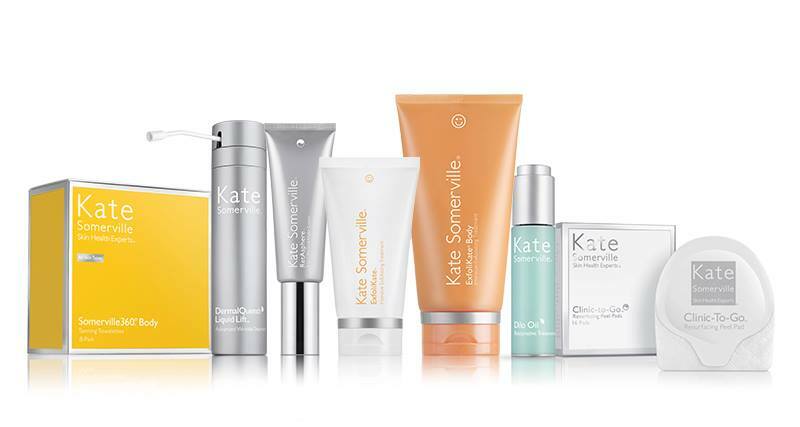 Below are some of Kate’s favorite tips and products for revealing a more youthful looking complexion. Cleansing – Many of my clients rush through the cleansing step. At my Skin Health Experts Clinic, we actually perform a dual-cleansing method. First, skin is cleansed with a milky cleanser to remove dirt, oils and makeup, and then we follow with a cleanser that is best suited for the client’s skin. At home, I also love using a clean washcloth to steam and soften skin. Always remember to cleanse correctly, especially at night! Your skin needs to be cleansed properly in order to repair and for your products to work effectively. Exfoliation – After cleansing, every treatment at my Clinic starts with ExfoliKate! Why? The dry, dead layer that sits on the skin’s surface not only dulls the complexion, it also prevents products from absorbing effectively and can make the texture of skin look uneven. Exfoliation will help skin look brighter, smoother and more even. It also sets the stage for flawless makeup application. I recommend exfoliating twice a week. Look for products with Fruit Enzymes and round, smooth beads. That way, you experience the benefits from both physical and chemical exfoliation. Hydration – Hydrated skin is healthy skin. When skin is hydrated, it bounces back! When skin is dehydrated, fine lines and wrinkles are more prominent. Expression lines, like the elevens in between your eyebrows can also be exaggerated. Serums containing Hyaluronic Acid will add much-needed hydration into your regimen – plumping skin and restoring that youthful bounce. My personal favorite is DermalQuench Liquid Lift Advanced Wrinkle Treatment, and I never leave home without it! This unique, oil-free, foaming booster delivers an infusion of hydration and oxygen for both immediate and long-term results. Eye Creams – Your eyes reveal lack of sleep, too much sodium and a host of other poor habits. Rejuvenate your eye area by using an eye cream to nourish the eye area and help with puffiness, dryness and fine lines and wrinkles. I recommend using a product with illuminating properties so the light softly highlights the under eye area and the upper cheekbone. SPF – Not all sunscreens are created equal, but year-round SPF is a necessary part of any skincare regimen, especially if you are battling discoloration. I was never a believer in combining an anti-aging moisturizer with an SPF because the anti-aging actives need to be delivered deeper into the skin to be effective while Sunscreen works best on the skin’s surface. I was able to create lightweight sunscreen formulas with a revolutionary reservoir system which keeps key ingredients separated so they stay where they work best! Retinols – Retinol is one of the most powerful ingredients in an anti-aging regimen. I’ve seen clients who’ve used Retinol products for years and their skin looks healthy, youthful and glowing! The key is cell turnover and the stimulation of collagen. You may also use Retinol products all over your chest, neck and on the back of your hands. Be sure to apply sunscreen wherever you are applying your retinol products. Pollution Protection – Pollution can increase damage to the skin. Contaminants and carcinogens can cause issues ranging from sensitivity to premature aging. Incorporate Antioxidants to help combat environmental pollution. Other aspects of your regimen such as proper cleansing and SPF also factor in to protecting skin against harmful environmental aggressors.